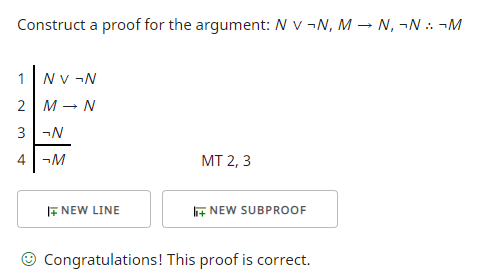 How would I use natural deduction to prove this argument is correct? It's always either night or day. There'd only be a full moon if it were night-time. So, since it's daytime, there's no full moon right now. I have also formalized the argument using truth functional logic. I'm not sure if it is completely correct though and I would much appreciate help if is is not. This assumes Dt and D, and Nt and N have the same truth values (intuitive assumption). Note that 1 is formulated using ↔ and ~. That is the standard formulation of exclusive-or: when we want to say that the two options are exclusive, i.e., only one of them can be true. We will use atomic sentences to represent or symbolize, certain English sentences. M: There is a full moon. With this symbolization I can write It's always either night or day as N v ¬N. I will write There'd only be a full moon if it were night-time as M → N. I see the last sentence as giving another premise that it is daytime, that is, not night. So I have as a premise ¬N. The conclusion I hope to derive from this is ¬M, that is, it is not the case that there is a full moon. The MT step is "modus tollens" and it is described on page 125. There may be other ways to approach this problem. The resources listed below may be useful supplementary materials for learning natural deduction. (Night or not-FM) and not-(night and not-FM). 2a. (night or not-FM) and (not-night or FM). This design uses "not-night" in place of "day". The exclusive OR takes care of itself because of the law of the excluded middle (a thing cannot both be and not be). Then, it is either Night or there is no Full Moon. Also, there cannot exist at the same time Night and no Full Moon. Here, it is necessary to create the exclusive OR, as that is clearly part of the premise ("only...if"). 2a. This statement is equivalent to 2. The premise "Day" becomes "not-Night". Conclusion. The conclusion follows from (2a). In the first part of (2a), "not-night" denies the statement "night", and so "no Full Moon" follows. As to the second part of (2a), "not-night" simply affirms the first term of the OR statement, and the result neither contradicts nor restates the conclusion. I am not entirely satisfied with this derivation, but there it is. Thanks to Bertrand Wittgenstein's Ghost, Mauro Allegranza, and rus9384 for the observations about the exclusive OR.